Scott Leitch has quit his post as manager of Ross County, following the club's relegation from Division One. The Dingwall side dropped into the Second Division on Saturday after a 3-2 home defeat by champions Gretna. Director of football George Adams said: "I had a meeting with Scott and he intimated his wish to resign due to private and personal reasons." Leitch, who won the Challenge Cup in November, took up his first managerial job last April. The 37-year-old Leitch, formerly of Motherwell, Dunfermline Athletic, Hearts and Swindon, had to work with a limited budget. And the club, who have implemented an impressive youth system, may consider a return to part-time football to further reduce costs. Craig Brewster, formerly in charge of Inverness and Dundee United, is sure to be linked with the job. 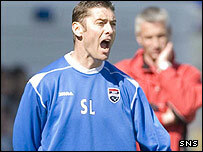 But the veteran player-coach is also on the list of candidates for the vacancy at Livingston.